The leader of Britain’s main opposition Labour Party, Jeremy Corbyn, will meet senior EU officials on Thursday after warning he may oppose any Brexit deal negotiated by the London government. 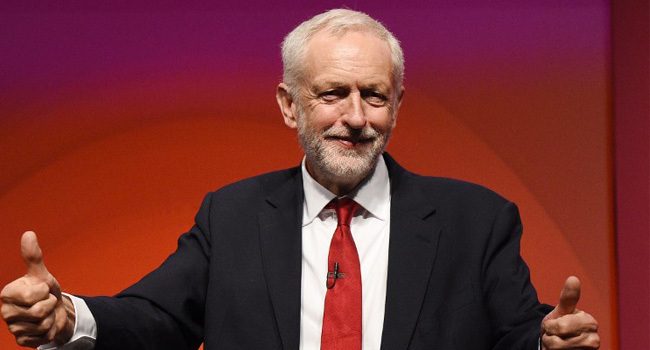 Corbyn, who told his party conference Wednesday that a no-deal Brexit would be a “national disaster”, has nevertheless said his party will vote against any accord based on Prime Minister Theresa May’s plan. European officials and many EU member state leaders also oppose parts of May’s “Chequers” blueprint but worry Britain could crash out of the bloc if an eventual deal is refused by British MPs. Corbyn’s answer is that May should call a general election, in the hope that Labour wins power and then negotiates an exit deal that he said would better protect jobs, trade and workers’ rights. There is barely any time for such an arrangement to bear fruit, however — under the terms of Article 50 of the EU Treaty, Britain will leave the Union on March 29 next year, with or without a divorce deal. Labour’s Brexit pointman Keir Starmer said on Twitter that he and Corbyn would be in Brussels to attend a ceremony to name a square after murdered fellow Labour MP Jo Cox, before their meetings. An official in EU negotiator Michel Barnier’s office confirmed that Corbyn was expected at a meeting after the ceremony.